Career Planning: Where do old devs go to? We are pretty much always looking for new people, what is holding us back from expanding even more rapidly is the time that it takes to get to grips with our codebases and what we do here. But that also means that we usually have at least one outstanding job offer available, because it takes a long time to fill it. But that isn’t the topic for this post. I started programming in school, I was around 14 / 15 at the time, and I picked up a copy of VB 3.0 and did some fairly unimpressive stuff with it. I count my time as a professional since around 1999 or so. That is the time when I started actually dedicating myself to learning programming as something beyond a hobby. That was 15 years ago. That sort of made sense, some people got into software development for the money and left because it didn’t interest them. From the history of Hibernating Rhinos, one of our developers left and is now co-owner in a restaurant, another is a salesman for lasers and other lab stuff. However, what doesn’t make sense is the ratio that I’m seeing. Where are the people who have been doing software development for decades? Out of the hundreds of CVs that I have seen, there has been less than 10 that had people over the age of 40. I don’t recall anyone over the age of 50. 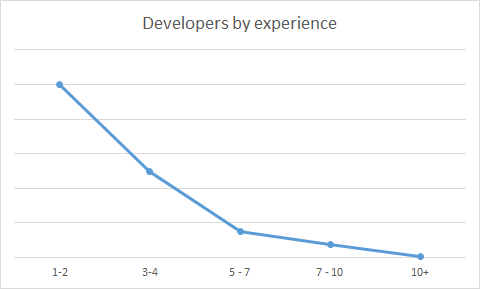 Note that I’m somewhat biased to hire people with longer experience, because that often means that they don’t need to learn what goes under the hood, they already know. In fact, looking at the salary tables, there actually isn’t a level of higher than 5 years. After that, you have a team leader position, and then you move into middle management, and then you are basically gone as a developer, I’m guessing. What is the career path you have as a developer? And note that I’m explicitly throwing out management positions. It seems that those are very rare in our industry. Microsoft has the notion of Distinguished Engineer and Technical Fellow, for people who actually have decades of experience. In my head, I have this image of a SWAT team that you throw at the hard problems . Outside of very big companies, those seem to be very rare. And that is kind of sad. In Hibernating Rhinos, we plan to actually have those kind of long career paths, but you’ll need to ask me in 10 – 20 years how that turned out to be.